Screws come in two basic types. One type is for fastening wood, the other for fastening sheet metal. The two types are similar in all respects other than their threads. Wood screws have relatively wide-spaced, medium-depth threads. Wood screws over an inch long have a threadless shank that's about one-quarter to one-third the total length of the screw. Sheet metal screws have deeper, closer, sharper threads that always extend over the entire length of the screw. Small pile of screws on table. The two types of screws are not fully interchangeable. While a sheet metal screw can be used to securely fasten wooden pieces, a wood screw with a smooth shank portion won't create a tight joint in sheet metal, and fully threaded wood screws may hold poorly. Both types of screws are readily available in lengths between 1/4 inch and 3 inches, adequate for just about any household fastening job. The shaft diameters of both wood screws and sheet metal screws are not stated in inches but rather by industry numeric gauge sizes ranging from Nos. 0 through 16. A No. 0 screw is a mere 3/50 of an inch in diameter, while a No. 16 screw is 3/8 inch in diameter. Common sizes include a No. 5 screw (1/8-inch-diameter shaft), a No. 9 (11/64-inch), a No. 14 (1/4-inch) and a No. 15 (5/16-inch). 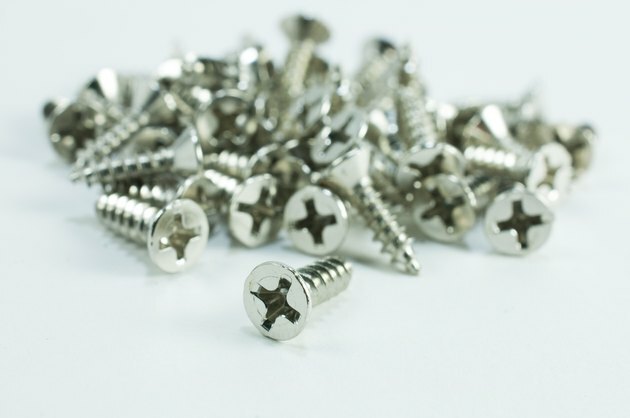 Wood and sheet metal screws come with flat heads, oval heads or round heads. The flat head pushes an indentation into the material when the screw is tightened so that it ends up flush with the surface. In wood, the flat head can be driven below the surface and concealed with a wood or putty plug. The oval head is wider than it is tall. The round head is equal in width and height. These latter types remain exposed on the material's surface. Both types of screws come in regular slotted and Phillips heads as well as square drive and different brand-name heads. Sheet metal screws also come with hex heads, which are driven with a magnetic hex driver fitted to a drill. Wood screws and sheet metal screws both come in different metals, including mild steel, hardened steel, stainless steel, aluminum, brass and bronze. Steel screws come plain or in rust-resistant plated or galvanized types. Stainless, aluminum, plated and galvanized screws are for outdoor projects exposed to a lot of moisture, while brass and bronze screws are sold mainly to match brass or bronze hardware.